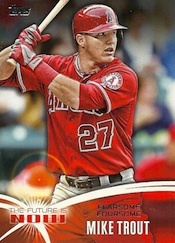 2014 Topps Series 1 Baseball focuses a lot on baseball's new generation of youngsters. The likes of Mike Trout, Bryce Harper, Clayton Kershaw and Yasiel Puig are leading the game into an exciting frontier while current legends like Derek Jeter and Mariano Rivera wind down their careers. 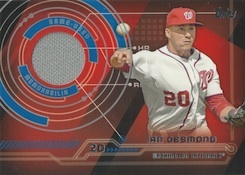 2014 Topps Series 1 Baseball pays particular attention to this youth movement with the tagline, "The Future Is Now" and several inserts to go along with it. 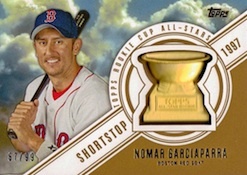 Being the flagship Topps set, there is plenty of nods to the past as well. Just expect a rookie angle on most of them. As with past years, hobby boxes have one autograph or relic card. 2014 Topps Series 1 Baseball jumbo boxes have an autograph and two relic cards. The 330-card base set features a familiar mix of veterans, rookies who debuted late in 2013, highlights, league leaders and World Series highlights. The Future Stars subset makes its return as well. The base set also has lots of parallels to keep player and team collectors busy. These include Red Hot Foil (1:6 packs), Gold (#/2014), Camo (#/99), Black (#/63), Pink (#/50), Clear (#/10), Printing Plates and Platinum (1/1). Black parallels and Printing Plates are found only in hobby and jumbo packs. Clear parallels, new to 2014 Topps Baseball, are numbered to 10 and only in hobby packs (not jumbos). 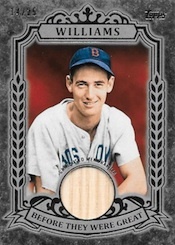 Silk Collection (#/50) returns as a partial parallel of 100 cards to hobby and jumbo packs. 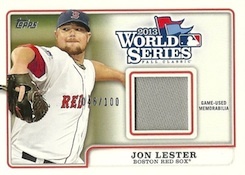 Most of the variation short prints follow a postseason theme. Walmart packs have an exclusive Mike Trout variation as well. Nearly all basic inserts in 2014 Topps Series 1 Baseball come with a rookie focus. The Future Is Now (1:4 packs) has a 30-card checklist but focuses on only ten players. Each has three different cards that highlight their top MLB moments thus far. Upper Class (50 cards, 1:4 packs) spotlight top rookie classes through the years. The MLB Draft has been around for 50 years. 50 Years of the Draft (10 cards, 1:18 packs) look at key players and moments to emerge from the annual event. 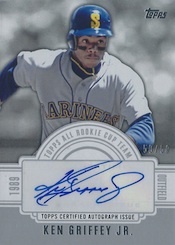 Topps All Rookie Cup Team (1:18 packs) recognizes the ten best players to be named to the annual squad. Before They Were Great (30 cards, 1:18 packs) looks to take the spot of The Greats from 2013 Topps Baseball. Exclusive to hobby and jumbo packs, these inserts are more premium in nature, using images of current and retired players from early in their career. A Gold parallel is numbered to 99. For its retro mini set, 2014 Topps Baseball takes a slightly different approach. 1989 Topps Mini Die-Cuts (50 cards, 1:18 packs) use the familiar design but with a twist. The white borders have been removed. 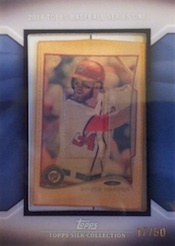 Borrowing a concept from Topps Museum Collection are Framed Rookie Reprint cards. Found only in hobby and jumbo packs, classic rookie cards are recreated with metal frames. They come in three versions, Black, Silver and Black, based on the frame color. Silver and Black are serial numbered as well. Although there are a couple of exceptions, many of the autographs in the set come in the form of parallels to other insert sets. These include The Future Is Now Autographs (30 cards, #/25), Upper Class Autographs (25 cards, #/50), and All Rookie Cup Autographs (five cards, #/50). 1989 Topps Mini Die-Cuts Autographs (ten cards, #10) and Before They Were Great Autographs (15 cards, #/10) both have signed versions as well. However, these are signed on-card. Trajectory Autographs show how featured players have evolved since their rookie years. 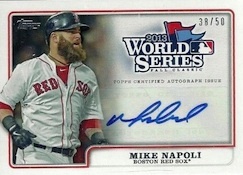 World Series Autographs (five cards, #/50) and Postseason Performance Autographs (ten cards, #/50) honor those who made playoff appearances in 2013. All of the above autograph sets except Trajectory also have signed and unsigned relic versions. Trajectory has 40 relic cards but no autographed memorabilia cards. In football, Strata has a brand built around it. It's making its diamond debut in 2014, only as an insert set instead. Exclusive to hobby and jumbo packs, Strata Signature Relics use a layered shadow box approach. The numbered cards have a large relic piece is on the bottom with a signed piece of acetate and multiple player images. Collectors can also be on the lookout for one-of-one Strata Cut Signatures. 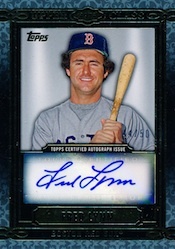 Manufactured relics have become a staple to the main Topps baseball set in the last couple of years. While not every collector is a fan, they consistently perform better on the secondary market than a lot of basic jersey and bat relics. Commemorative relic cards land one per hobby case and one per jumbo box. All Rookie Cup Team Rookie Cup (#/99) have Topps Rookie Cups embedded in the cards. The checklist focuses on ten all-time greats who have been named to Topps' All-Star Rookie team over the years. A Vintage Parallel (#/25) has a replica of the original trophy rather than the more modern version. Rookie Cup All-Stars takes a similar approach with 25 additional players. 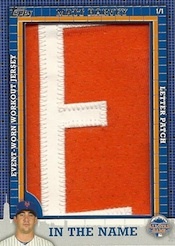 Basic versions are once again numbered to 99 with parallels numbered to 25. Class Rings Silver has a checklist of 25 greats with a faux ring relic that mentions their rookie year. Gold parallels are numbered to 99 while Gold Gems (#/25) have replica gems embedded within them as well. Gold Gems Autographs (#/10) come with a signature as well. 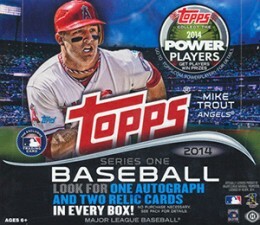 2014 Topps Series 1 Baseball has a couple of retail exclusives as well. 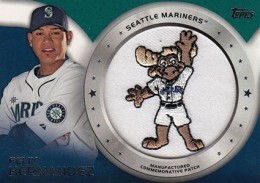 Blaster boxes once again have Commemorative Manufacturer Patch cards and Rookie Card Manufactured Patch cards. Both sets have 25 cards. 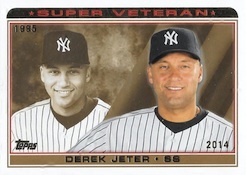 Retail packs also have exclusive Super Veterans cards. Five Super Veterans Autographs are numbered to 10 copies each. The ten Super Veterans Relics are numbered to 25 while five Autographed Relics have just five copies each. 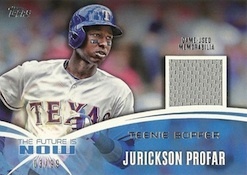 Promotions in 2014 Topps Series 1 Baseball continue with the rookie theme. 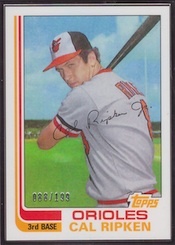 The top 50 rookie cards in Topps' history (as determined by the card maker) are inserted as random rookie buybacks. Every MLB team also has a Pennant Chase card. Similar to Stadium Club Super Team cards from the 1990s, if the team wins the pennant, the card can be redeemed for a prize. Also, a new digital feature, 2014 Topps Power Players, offers collectors a shot at autographed cards and memorabilia, baseball game tickets, and their very own Topps baseball card. 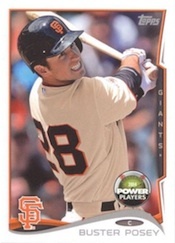 Found in 2014 Topps Baseball, special Power Player Parallels contain codes that can be loaded on the Power Player website. Collectors can win exclusive parallels and coin cards. The more cards in your collection, the more chances to win. The players in your collection benefit from on-field success and random drawings will occur for specific players. The promotion lasts all season and if you enter all Power Player Parallels (220 total cards between Series 1 and Series 2), you are eligible to win one of five sets containing 40 autographs, or your very own Power Collector card in Topps Baseball. Further details can be found here. JAMES PAXTON 2014 TOPPS SERIES 1 RED HOT FOIL ROOKIE RC REFRACTOR SP! YANKEES! 330 cards. Card 7 does not exist (here's why). Shop for base sets on eBay. PARALLEL CARDS: Blue (Walmart), Red (Target), Purple (Toys 'R Us), Green (Retail Rack Packs), Yellow (Retail Hanger Boxes), Red Hot Foil - 1:6 packs, Gold #/2014 (1:9 H/1:2 J), Camo #/99, Black #/63 (Hobby/Jumbo), Pink #/50, Clear Stock #/10 (Hobby only), Platinum 1/1, Printing Plates 1/1 (Hobby/Jumbo) Click here for a full break down of all parallels. List is not complete and is a work in progress. Click here for a detailed visual guide. 24 cards. #24 not included. View our complete Spring Fever guide here. Print runs noted when available. View our complete Spring Fever guide here. 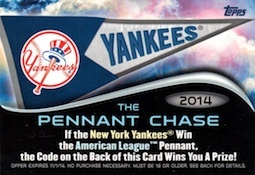 Every team will have a Pennant Chase card in product. If the club wins the pennant, it can be redeemed for a prize. Here are the 5 best deals on jumbo boxes currently listed on eBay. Good: Crisp colorful photography. Variation short print cards. Insert cards galore. Strata Signature Relics. Interactive inserts like the Pennant Chase and Power Players online codes. Bad: Only one hit card per hobby box. Most autographs are stickers. Sparkle variations are tough to spot. The Bottom Line: 2014 Topps Baseball Series 1 Baseball is an outstanding product. The base set is loaded with veterans and rookies. Every year this is the standout baseball product that a lot of collectors wait for. 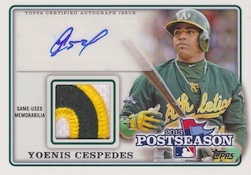 Topps delivers once again with a stellar product to help build excitement for the upcoming baseball season. The base card design is the standard white border surrounding colorful action photos, which collectors have come to expect. 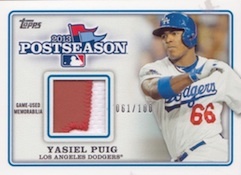 Every year Topps releases the same simple design with an updated, refreshed look to it. Parallels come with 13 different versions, some which are only in retail packs. Some collectors only have local access to cards at Target, Walmart, and Toys R Us since they don’t have a hobby store near them. Including retail only-exclusive parallels will helps make these packs more interesting. Photo variations are included, but majority come with the return of stealth sparkles. To the untrained eye, collectors can easily miss them. I had to look very closely at every variation player to see if I had a sparkle card. Inserts are abundant in 2014 Topps Baseball Series 1 and focus on rookies of past and present. 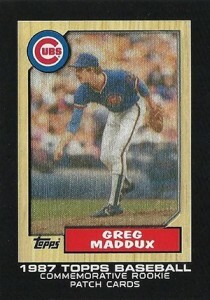 Mini cards mimic the 1989 Topps design but with colored borders. My favorite insert is The Future Is Now set. Ten top rookies in the last few years are highlighted with three cards each. 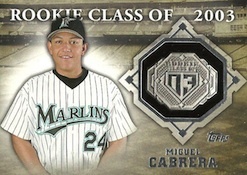 Other eye-catching inserts are All Rookie Cup Team and Upper Class. 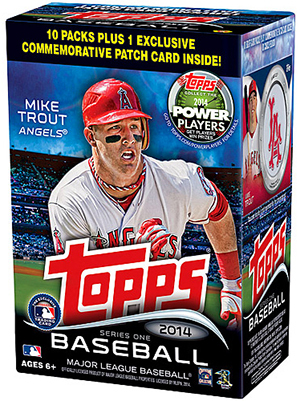 Buyback cards are inserted with a silver Topps 75th Anniversary Logo. The majority of the autographs and relics are variants of basic inserts. Unfortunately, the autographs are stickers. This is a shame, especially on the Postseason Performance and World Series Champions autographs. The base card set is comprised of 330 base cards which includes an assortment of veterans, rookies, highlights, league leaders, and postseason. Similar to last year, card 7 does not exist. 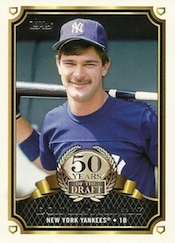 There are 75 variation cards, several of which feature players on the Series 2 checklist. The inserts sets are focused mainly of rookies and rookie themed designs. The autograph checklist boast top players like Mike Trout, Bryce Harper, Nolan Ryan, Tony Gwynn, Ken Griffey Jr. and Cal Ripken Jr. There are also lots of lesser players as well. 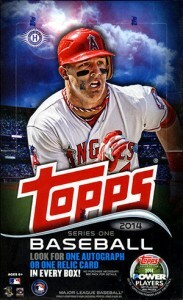 2014 Topps Baseball Series 1 Topps is an affordable product for collectors of any age. Even though you only get one hit card per box, there are enough parallels and inserts to more than make up for the lack of hits. There is also the fun of building a base set. Many collectors will likely find the sparkle variation cards. Don't let the low price per box fool you. This product is an annual hobby staple. 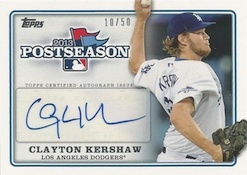 Topps delivers another standout baseball product to start the 2014 season. This is a great box to introduce a young collector to the hobby. Each pack is a blast to open, especially with a parallel or insert card in each one. You should get about 95 percent of the base set in one box. Topps definitely hit a grand slam with this product. I like the base card design and the mocked up inserts (especially the Rookie Class inserts), but I will never understand why Topps goes completely crazy on the inserts. I also hope they get the bugs worked out of any online game that the code cards feed into before it goes live. This is just different enough. Nice effort, Topps! Interesting ideas, especially with the 1989 Topps design for die-cuts. The problem is that I grew up during the mass production era and I know 1989 Topps like the back of my hand (as well as other issues). Again with the white borders… instead of doing parallels with color, why not make the regular cards that nice? Yeah, the white borders are getting old. How about we bring back the blue from 2003? this design looks desperate. Like they had no other designs…don’t really like it. 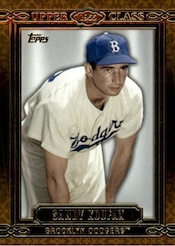 I always love the regular Topps, but how come there haven’t been any Dodgers on any of the Topps products in the past 5-6 years? Always such a waste of space with the large white border. MLB should bring back some competition – maybe Topps will try harder then. This is another lazy product and once again, way too many inserts. Been collecting your products for 40 years…why not be a little more original and one year make your baseball cards in the shape of baseballs…a guaranteed best seller. 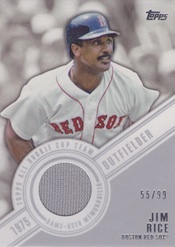 Joe � Might work as an insert set but Fleer tried it in 2003 with a set called Hardball. Wasn’t a huge success. They do look neat, though. 40 some insert sets not to mention parallels? baseball is STARVING for competition. I for one cant believe MLB renewed topps exclusive contract. im looking forward to donruss coming back and I don’t even like logoless cards that much. I think im just that sick of topps. Stuish � Nothing has been announced either way. With the Red Hot Foil for 2014, I’m assuming to be like 2013’s Emerald, are the retail parallels (Target-Red, Walmart-Blue & Toys-R-Us-Purple) being discontinued? The right side of the cards are ugly, but I like the rest of the base card design., especially the bottom. 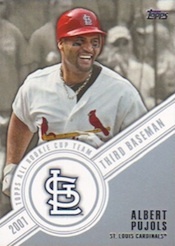 I too would like to see a change from the white borders-perhaps green like Topps 2001, gold like ’02, blue from ’03 (like Cory mentioned), or black from ’07? 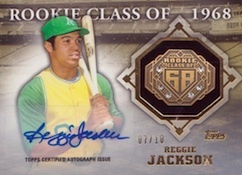 I also like the insert idea of the all-time Topps All-Rookie team. 60$ a box we can’t really ask for more but I’m gonna wait for a deal at 30-35$ in june when the second part gonna be released or a jumbo at 60$. 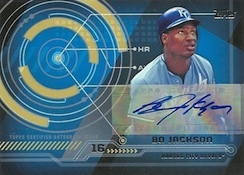 With a low-average player auto, this product is always cool but no more. I think topps have to put a booklet in a case to be more attractive. when is the checklist going to become available? Isaac � Likely shortly before the set’s out. Very tired of the white borders and same old design. At one auto per box, an on card auto is a must. Very thick insert cards are a pain. Sparkle cards and variants, who buys them? Burned out by the time the update sets come out. Honor rookies over hall of famers, never. Give me a legendary player any time. Don’t you mean 36 packs per box not 36cards per pack for the Regular Hobby? 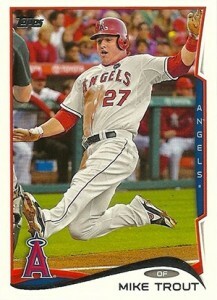 Is anyone else upset that many of the photos are the exact same shots used by Topps in their 2013 Topps updated set? Come on, man! K-MAC � The images shown here are mock-ups done months in advance and might not necessarily be the final ones used. They could be, which would be lame, we won’t know for sure until set actually comes out. vinny g � No word on Tanaka yet. I’d be shocked if he’s not or Bowman or something sooner. OK, I have been researching and have no clue what people are talking about, when talking about the strata insert. ccan someone please tell me? thanks for the quick response. also people have been finding green parallels of the 2014 topps however on your checklist there is no parallel like that. is there a surprise parallel topps is hiding? Isaac � The info we receive is based on hobby packs. We do our best to add retail as we find out — such as the Green. I haven’t had a chance to add them yet. I asked one seller and they said they pulled it from a rack pack. There are also Target Red again (and likely Blue for Walmart and possibly Purple Toys R Us). Any word at all on a wrapper redemption? GregA � Not official word either way, but it looks unlikely. That could change, though. have they hit retail yet? prufrock � In some places, yes. The same old pictures over and over and over! Boy I wish a new innovative and creative company could obtain an MLB license! Same old product different year! I actually like the quantity of inserts as topps is not an expensive set to finish and I’m really looking forward to the clear parrellells. The white borders are super old and I hate buying cards without official logos. Topps needs sine licensed competition quickly. And I would like to get a hit of each auto and relic for an extra few bucks per box. That being said the flagship gives unparellelled bang for your Buck especially retail industry. I remember. My reentry into the hobby to see how nice topped had become in 2008. I thougt I hit the lotto. I will always look back at that when things get complacent. Also this could use a gimmick insert like the major league movie cards in archives or A&G cards to take away from the monotonous design. I will pick up a box but probably wont chase any sets unless the clear are relatively cheap. This has got me thinking next year before this year has begun. ryan, thanks for the answer on retail…actually, I got kind of obsessive after posting the question–got up, got dressed, took three retail stops before–JACKPOT! Four blasters, 2 hangers, and one of those 36 card boxes. Then I stayed awake to open all of them dutifully studying each card. My overall impression: I like these much better than the 2013 set. I agree on some of the repetitive photo concerns (though it’s really not that bad), but overall I think the design is quite solid–except for the die-cut minis, which aren’t very nice to look at and are a pain in shape. Inserts are nice, parallels are really mixed which is nice. Favorite feature: the contest cards are now parallels, with the fronts the same as the respective player’s card, though the backs contain the contest info. Very nice touch. Overall, I’m a high 3 (I picked 4 on the star system because my 3 is closer to 4 than 3). I can confirm pulling two yellow parallels (and several red) out of a hanger box from Target, and a green parallel from a 36-card jumbo? pack, also from Target. So they are definitely in retail, at least at Target. Gold parallels also in both packs, both with damage. pulled two vintage cards out of a box of jumbo. larry parish of the expos 1979 and lee Thomas of Houston 1967(?) they don’t seem to be reprints but do have the topps 75th anny logo in the corner.. any ideas? emeeks � Buybacks similar to those from Heritage and Topps 75th. it also didn’t have a spring fever redemption in it..
emeeks � brentandbecca noticed this as well. Not sure what’s going on there. gotcha, thanks for the quick info although it didn’t have a spring fever, it did have a 4th power players card so maybe that has something to do with it. It makes me sad that they have MLB exclusive rights and have no inspiration. question for Ryan and/or any posters: I pulled a 1972 buyback; it is a semi-high number. 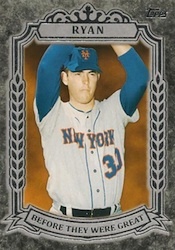 I have been working on my 1972 set for a year or so–and just happen to need this card. My question: is it tacky to use a buyback card in set building? Personally, I’m not concerned (my collection, my way), but I may decide to sell the set in the future. I don’t mean to get off topic of the thread, but thought folks might have some input. Either way, thanks. prufrock � If it’s for your own collection and you’re happy with it, I don’t see an issue. Maybe use it is a filler until you find another one you’re happy with? thanks Ryan…just my luck, my buyback has nice corners, very sweet surfaces (front and back), and is so off center that I know it is a true early 70s card. Still, the buybacks are nice. I also pulled a framed Brooks Robinson rookie reprint. I really like these–nice additions to the mix. 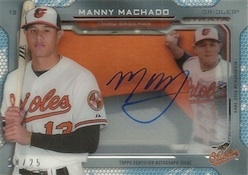 In general, the inserts are nice–but the autos and relics are not that great so far. Overall, nice set–even nicer today with 2 jumbo boxes instead of yesterday’s late night retail binge. Just bought a blaster box and got several cards where the name wasn’t silver. Any word on if it’s a mistake or if it’s another stupid parallel? matt � Printing error. Seems to happen every year. prufrock � Sounds about right. I’ve heard two per jumbo box. I think they’re an unannounced surprise so not listed on packs. I’ve bought about 20 packs from a hobby box and have pulled some pretty cool cards. Love all of the different inserts. First pack I opened I got a World Series Autographed Relic from Felix Dobrount (#6/50). IIRC, the odds for buy backs in the hobby jumbo are listed on the wrapper as 1:5 (2 per box). I opened one box, got 2. Also didn’t get any Spring Fever cards, although they were listed as 1:10. I was surprised none are showing up in the usual selling avenues. I see no one is pulling them. I really liked that promotion last year and was hoping for it again this year. Does anyone know if they pulled the plug on it? vrooomed � Not sure. There are Spring Fever cards on the checklist. It’s possible it was switched to a basic hobby shop promotion — but I haven’t heard either way, just the redemptions aren’t being found. Talking to my friend who owns a local hobby shop, he has no idea what’s going on. Topps has not contacted him regarding the promotion at all. Last year this time he already had the packs. Love this set, love the inserts, love the idea of a short print but hate the sparkle versions… much rather see a different themed picture. they must not have had a good collection of photo for everybody they wanted. overall, the set is awesome. Not much to explain. More Topps common design. What’s about those 2014 Topps buy back? I have seen some of those old cards and look in very bad shape. Damaged cards with the Topps logo. Noel Martir � I think they’re intended to be a bonus. 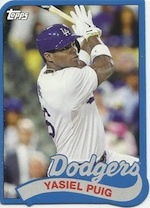 Just sold a yellow boarder PUIG from retail on e-bay. got $20.50 for it, Im happy…. What are the “buyback” all about? Does that mean if I mail them to Duryea or wherever they go, I’d get a replacement that is in actual good shape? The product itself is pretty darn good. Got Jeter rookie reprint 2/99. Harper and Cobb rookie class, Trout, Strasberg and Sutton patch cards, crappy autos, 1 pink, 2 blacks. Puig sp future star, both Kreshaw SP’s, Upton SP but no sparkles as of yet sadly. Don’t like how the ’89 mini die cuts can be bent on bottom so make sure to store them upside down to stay in good condition. Why is there no #7 card? Just found out why. But why so much tribute to Mickey Mantle? He is one of the greats but is he the great? Pulled a Before They Were Great Auto Redemption card from a Jumbo box, its BGA-RC Roger Clemens? I don’t see this on the checklist?? Doug � Thanks for letting us know! Any idea why the Clemens Auto Redemption doesn’t appear on the checklist? Rarer than the others or no big deal? Two straight hobby boxes (bought and opened on consecutive days)–from the same case, per my local shop–framed rookie reprints (Gibson #/25, Koufax #/199)…was this lucky, or are they that abundant (which would be odd to me since I pulled only one from previous three jumbo and three hobby boxes)? That second box included the Koufax, a Gerritt Cole silk, three vintage, a Puig sp, black and camo parallels. Closest thing to a hot box I can imagine from a “regular” release like this product. 1. Bruce Rondon Trajectory jersey relic. 2. Ricky Nolasco Trajectory autograph. 3. Tony Gwynn silver framed rookie reprint #/99. 4. Willie Mays Rookie Class Ring #/99. 5. Carlos Gomez Silk Collection #/50. 6. Shane Victorino black border parallel. 7. Matt Shoemaker pink border parallel. Love the idea of Photo variations, and sparkle SPs. The inserts are nice too, and a ton of good shots at some nice hits, especially with the HTAs. I must be lucky. 1 hobby, 2 retail rack packs, and a Jumbo and I’ve pulled 3 sparkle SSPs. I might hit the bay, and go for all 50. Pedroia, Longoria, and Machado is a good start. First rack pack I bought from Walmart had the Pedroia sparkle, score! Nice set, good depth, nice hits, and big names. Not so about the Spring Fever Redemption cards, I have purchased two Hobby boxes and have yet to find a Spring Fever Redemption Card. Question – On the Checklist, for Super Veterans Set – Says 30 Cards, but only lists 15. Andrew Rupprecht � It was incorrect. There are only 15 cards in the set. Wait…isn’t every year conisdered the future is now? Every year there are new rookies and people retire. Players get over hyped every year by card makers. Nothing new in 2014. My score is 3, kind of a lazy card set. I don’t really collect baseball card’s (hockey guy) so I only bought 1 jumbo pack and 2 regular hobby ppacks for $15 total and I’m very happy with what I pulled. A machado future Star’s, puig future Star’s, ernie Banks framed rookie reprint /199 and for the big boy I pulled a Strata autograph relic redemption of Yu Darvish /25. Will be buying more! This is our first box of topps baseball and it was a blast, however we have two older cards which I gather are 75th buybacks. What does that mean? The cards are absolutely cool, wish NHL hockey cards would have offerings like this. Marina � They’re original cards with the stamp added to them. Been pretty excited about these so far. Decent cards and I have had great luck on pulling good inserts. Pulled a Scherzer Sparkle SP and a Matt Carpenter SP Sparkle from Walmart rack packs. Also, and I still can’t believe they actually had these in there, I pulled a David Ortiz World Series Champions auto numbered to /50! As a lifelong Sox fan, I’m keeping the Ortiz, but the other two have already sold on Ebay. anyone else have one that looks like its silver and not black? I like the product in general, but like most, wish there was more originality. The number of inserts is ridiculous. I would have prefered maybe 1 insert set, 1 base set and then 1 parallel set where all cards were done as 1972 or 1974 layouts. The number of insert sets just smells of a money grab on Topps part. First Hobby Box�bought for my son’s 8th B Day. Got 2 buybacks that were real bad condition but we got Nolan Ryan and Jimmy Fox (Before they were great) along with Jason Grilli Silk (whats this worth? ), an autograph Evan Gattis card and tons of “special cards”�felt like it was a real deal. Dozen “upper class” cards etc. one more Hobby Box? It says that you get one autograph or relic card�.I assume that is minimum? Could you possibly pull more? Seems we beat the odds on our box. Just wondering. Charlie � It’s always possible to beat the odds. As for values, the easiest thing to do would be to look up completed values on eBay. Just last year I got back into collecting baseball cards after a 6 or 7 year hiatus. I’ve purchase a pack a week from the local Wal-Mart or Mejier. I’m attempting to collect the entire base set. I have about 70% of the set as of now but have started pulling a lot of duplicates. I like the card design, nothing too special. Being able to only collect thru retail, I cannot comment on any big hits. I like the mini die cuts. Still think there are too many insert sets. Topps goes overboard on these in my opinion. I love the baseball highlight card of Mariano Rivera. Have not pulled it surprisingly. It might just be a base card but it will easily be my favorite card. Wayyyy too many inserts. I still try to collect them though. I like the future is now. 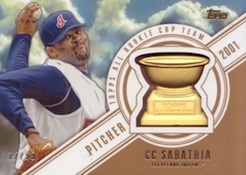 The design is bad, but I like how it is based off of the Topps Bundt card design. 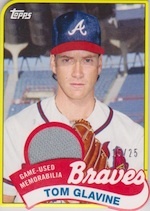 In our Series 1 hobby box we got a Craig Kimbrell #425. The whole rest of box was series 1. Any ideas? Love the product, pictures are great and it is fun seeing a few special cards come out of every retail pack. Sad to see most hobby shops have disappeared since I was a kid. My son just started loving baseball, as every 6 year old should. Problem is every pack is now producing 20+ dups and we still have over half the set to collect. None of the local card shops even bother to trade or even collect singles, which is a bummer since we can’t find any kids that collect. Is there any place online we can trade all of our dups with others? There has to be something out there, we can’t be the only ones highly disappointed with the abundance of the same cards. It just feels like they are producing many of some cards and few of others. Shaun � There are lots of traders on our message board/forum that you could probably trade with. Topps is always excellent but I agree with too many insert sets.